Built in 1941 to Diagram No E159 Lot 1640, the vehicle was initially preserved at Didcot by The Great Western Society. However, after a review of their collection, the GWS decided to reduce their duplicate stock, and as a result coach No 7362 was acquired well known preservationist, Bill Parker, in 1984. Stored at the Swindon & Cricklade Railway for many years, the vehicle was exposed to the elements where its condition deteriorated, and unfortunately it was also vandalised in recent years. Mr Parker kindly agreed to donate the coach to the DFLG in 2016. 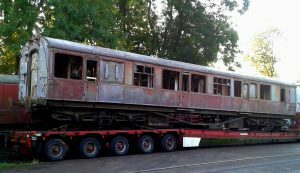 It was moved by road to the Dean Forest Railway in September 2016. Although at this point we have no indoor accommodation, a tarpaulin has been purchased for the vehicle to protect it from the weather, and to dry it out ready for restoration to start. The current plan is for restoration to start as soon as our “Pannier” No 9681 is back in steam. To this end the group are currently looking for GWR coach parts. If you feel you can offer any coach parts, e.g. fixtures and fittings, please get in touch via the contact page. Many thanks!